"Russell and I really enjoyed the session. He was seeing mosaics when he closed his eyes.... you've really inspired him back into doing art himself!!" Join experience mosaics tutor Tracey Cartledge for a weekend making mosaics inspired by the period decorative features at Victoria Baths. 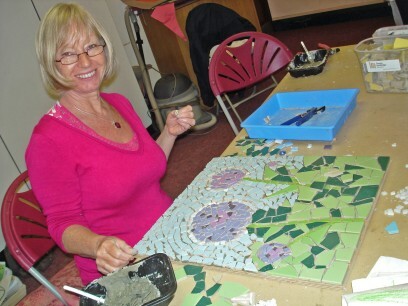 This mosaic workshop takes place 10am to 4pm on Saturday 14th and Sunday 15th July. Tools and all materials are supplied and the workshop is suitable for complete beginners and those with some experience.